Court freezes demolition of illegal Bedouin encampment built on Israeli land, grants town month-long reprieve. The planned demolition of an illegal Bedouin encampment built on Israeli land east of Jerusalem has been postponed for one month, after the Supreme Court of Israel ruled in favor of squatters living in the unauthorized community. Khan al-Ahmar, built in the 1990s on land belonging to the Israeli town of Kfar Adumim east of Jerusalem, is home to some 170 Bedouin, who have expanded the encampment in recent years with the aid of foreign governments. 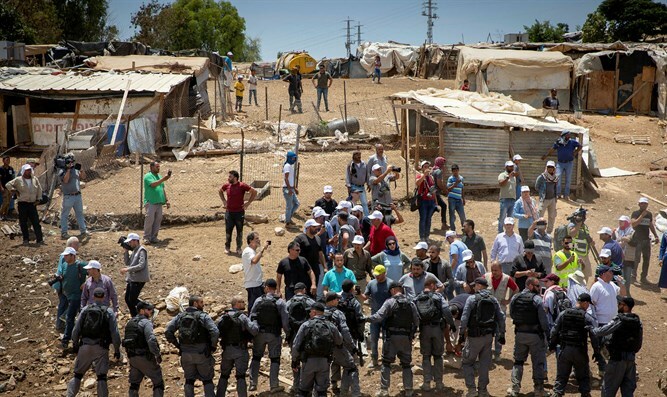 While Israeli courts, including the Supreme Court, have found the unauthorized encampment to be illegal, and approved its demolition, the United Nations and European Union have condemned plans to evacuate Khan al-Ahmar, and called on Israel to legalize the settlement. Last week, Israeli security forces began preparations to evacuate Khan al-Ahmar, and declared the area a closed military zone. But the demolition was halted last Thursday, when the Supreme Court accepted an appeal filed by eastern Jerusalem attorney Ala Mahajana on behalf of Khan al-Ahmar’s residents. The temporary injunction barred the state from demolishing the town for one week. This Thursday the court extended the prohibition, ordering the state to leave the buildings in place until August 15th.